I Made an Automated MaaS Business, and So Can You! For the past 2 years, I’ve been joking with my friends and former coworkers about building a business around a simple idea: MaaS! For the past 6 months, I’ve been telling conference attendees that I was really, seriously really working on a MaaS product, hoping it would force me to follow through. It’s been a long time coming, but I finally finished it, and it works! Oh — what does MaaS stand for? It means Memes as a Service! You really know that you live in the 21st century when getting a meme is as easy as buying groceries. My project is called Memeogram, and you can use it RIGHT NOW! All you need to do is pick a friend, decide how many memes you want to send to them, and select how “dank” you want the memes to be. In about 2 weeks, they will receive the memes via mail. Yes, I said via mail. Postcards, actually: the very way you would not expect a meme to arrive to you. 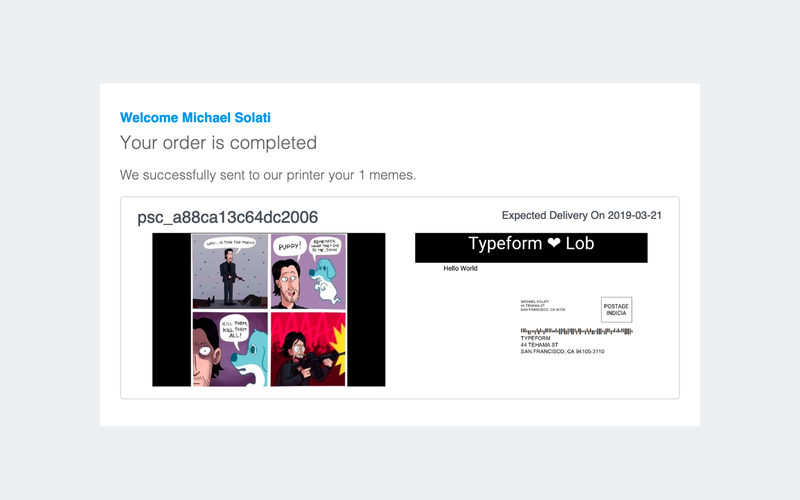 Here’s how Memeogram works under the hood: a sender fills out a Typeform, where we collect all of the information needed to send the memes by mail. When the sender clicks Submit, a Typeform webhook sends the submission to a Firebase Cloud Function. The Cloud Function parses the order, finds the best memes for the job, and sends a request to Lob to print and mail the order, all while keeping the sender up-to-date via emails sent with Mailgun. I know, it’s so fancy! Additional information like the sender’s email address or a message to include on the postcard would be a nice touch, but it’s not required to use Lob. After you create your form, the next step is processing submissions. This Firebase Cloud Function allows you to handle submissions and will serve as the endpoint that Typeform will send a POST request on form submission. // Our endpoint for handling the Typeform Webhook. // Here we parse out details from the form submission. By using an answers `ref` we map the response to in our postcard object. Two important things happen here: you store the postcard in a collection of all orders (which will trigger a submission to Lob), and you store the status of the postcard order in a status collection (which will be used to trigger Mailgun status emails to the sender). Firebase allows you to trigger functions when a Firestore Collection is written to. When a new postcard is saved to a Firestore Collection, you can trigger Lob to print a postcard. // This function will be triggered whenever a new document is created in the `order` collection. So when the above `webhook` function resolves, this function is automatically triggered. // Let's send the order to Lob for printing! You may have noticed that the code in the previous two sections writes to the status collection. This is because you’ll want to keep senders up-to-date on the status of their orders. Just like the Cloud Function that is triggered when an order is created, you will trigger this function to send Mailgun status emails when a status is created or updated. After you deploy the project on Firebase, you can fill out your form and watch the process run until you get a confirmation email you can use to track the order. Or you can try a deployed version of the demo app right here. While memes can be fun, other practical use cases that may exist is if you wanted to automate thank you cards being sent out to customers who purchase your product. Or perhaps a platform to contact ones local congress person via mail. To keep up with everything I’m doing, follow me on Twitter. If you’re thinking, “Show me the code!” you can find me on GitHub.